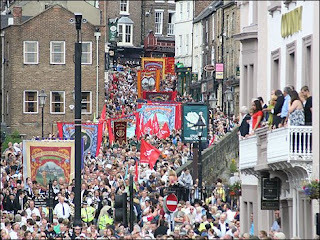 Last week Durham saw the annual Durham Miner's Gala: this year it attracted over 100 000 people to the city to remember the grant tradition of mining in Durham. This year numbers were doubtlessly swelled by the fact that it was 25 years since the miner's strike of 1984. The narrow streets were crowded with brass bands from the surrounding mining villages marching along the banners from the local National Union of Miner's lodges. Its an awe-inspiring and moving occasion. However, the elephant in the room (or at least in the streets) is the sad fact that there are now no working coal mines in Durham or indeed the entire north-eastern coal field. When I was doing A levels, it was common knowledge that the north-east (County Durham and Northumberland) was dominated by coal mining. Even then (in the late 1980s) it was notable that we covered this more in History than in Geography. The process of de-industrialisation may have reached a bloody climax in 1984, but mines had been shutting long before this. So when I started working in Durham and Northumberand a little under a decade ago it was no surprise to me that there was little active mining in the area. What was a shock though was the way the entire industry had been wiped from the landscape. Today, the only pitheads still standing are heritage attractions (at Beamish, Washington F Pit and Woodhorn). I was used to the former industrialised areas of Yorkshire such as Leeds, Bradford and Sheffield, where although many factories and mills were no longer working, the buildings themselves still stood. However, in the north-east the entire infrastructure of a globally significant industry that more or less underpinned entire sections of the regional culture has been entirely erased. It was not only the removal of all the mine buildings that is staggering, but the shifting of the spoil heaps. The spoil pit for the pit at Ashington was once the biggest manmade mound in Europe; its now entirely disappeared. Once in the course of work I came across some photographs of the Durham landscape in the 1950s. There many pictures of many mining villages I knew quite well, but they looked almost entirely unfamiliar because in the background were the spoilheaps standing high above the buildings. The end of the mining industry did not just mean the destruction of the mines themselves but an entire reworking of the landscape itself. I was told recently about the notion of the Anthropocene used to describe the period of earth's geological history when for the first time human's rather than natural processes began to influence the earth's geology and geomorphology. The mining history of Durham is surely a case study in this. 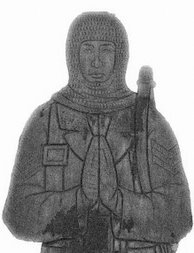 Now, though, there is clearly a growing interest in reminding people of the role mining played in County Durham. I think people are realising that babies born during the strike are now in their mid-20s, but have never known the county has a centre for coal production. The Gala, which nearly died in the late 1980s, is now bigger than ever (it's still the biggest regular political rally in the world). Almost all former pit villages have now erected memorials to their collieries. There is a burgeoning interest in oral history and local history; new banner's for the Gala are even being created. Despite all this enthusiasm, there is still a strange and silent gap where the mine's themselves used to be. There is also a political element to this. I've been told that following the '84 strike, English Heritage wanted to record the historic buildings and installations linked to the mines that were to close. Apparently, however, Michael Heseltine (President of the Board of Trade at the time) actively forbade this; it is hard not to see this as a vindictive act against the miners. The feeling that the mining industry should not be turned into a heritage resource was not, hoewever, simply promoted by the government. Many miners at the time felt strongly that what they saw as a living industry should not be turned into a heritage or tourist attraction. For them the wounds were fresh and the bitterness too raw. Consequently, it is not surprising at the time there was little appetite for protecting or preserving the pit heads.